Congratulations to the authors and illustrators of these award winning nonfiction books. The Sibert award is given to superior nonfiction, but two of the Caldecott honor books noted for their illustrations were nonfiction as well. I am so pleased that nonfiction is honored for its writing but also for its design. 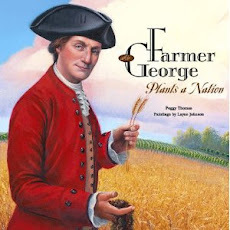 Although I kept my fingers crossed for my title - Farmer George Plants a Nation illustrated by Layne Johnson's exquisite paintings, I am glad to part of such heady competition. Recounting memories of his family's flight from the Warsaw Blitz and his years as a refugee during World War II, Shulevitz employs watercolor and ink to depict a boy liberated from his dreary existence through flights of fancy inspired by the map his father buys in the village market. Young Readers. In this picture book biography of William Carlos Williams, Bryant's engaging prose and Sweet's stunning mixed-media illustrations celebrate the amazing man who found a way to earn a living and to honor his calling to be a poet. Full color. Everyone has heard about new safety standards for children's products according to H.R. 4040, the Consumer Product Safety Improvement Act. But did you know that it also includes children's books? The CBC has been monitoring the situation and urges writers, readers and publishers to speak up. The testing of every children's book, new and backlist, would cost publishers thousands, and more importantly, according to prior tests does not appear to be warranted. The paper used in children's books is not a lead hazard. Contact your representative today. The Act goes into effect next month. I am thrilled to watch Barack Obama take the oath of office today. I can just imagine the books that will follow: biographies of the president, his wife and their two girls, historical perspectives bringing race relations full circle, behind the scenes look at the events, "How to Host 3 Million," personal stories of struggle and victory, and a child's eye view of this historic moment.... There are so many stories to tell. How would you write about this day? What Kind of Person Writes Nonfiction? For a couple of years now, Margery Facklam (my mom) and I have been working on a book about writing nonfiction for children. 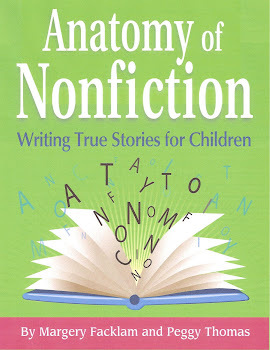 And one of the questions we asked ourselves was "What kind of person writes nonfiction?" We come from all walks of life -- Margery has a teaching background, I studied anthropology. Steven Swinburne was a photographer, Russell Freedman was a journalist, etc. But we all have one characteristic in common -- we love to learn. When author Annie Dillard described herself in Pilgrim at Tinker Creek she said, "I am no scientist...I am a wanderer with a penchant for quirky facts." That pretty much sums up most of us. We are perpetual students soaking up information and shining our light on common and not so common things. Besides being perpetual students we are also teachers eager to share what we have learned. And what we share is not just a collection of dry facts but information flitered through our own perceptions. We are as biased as anyone else. But our bias is to present the facts through a hopeful lens. This world might not be perfect but with hope someday it will be better. Nonfiction writer Milton Meltzer once said, "Almost everything I write has to do with social change -- how it comes about, the forces that advance it and the forces that resist it, the moral issues that beset m en and women seeking to realize their humanity... I have not been neutral; I see nothing wrong in the historian who feels a commitment to humane concerns -- to the ending of war, of poverty, of racism." Through our writing we show that there are struggles to overcome, whether it is learning how to play baseball or saving the manatee, and by telling the true stories of others who have struggled, we provide hope and motivation. Not a bad job to have. I have come a long way to be writing a blog. I never thought I'd do it. When I first started writing I used a Kaypro word processor that opened like a bread box and used 5 inch floppy disks. My manuscripts were spit out on ribbons of computer paper in dot matrix. Now my manuscripts dangle around my neck on a flashdrive. Who would have thunk it? My goal on this blog is to meet other folks who love writing and reading nonfiction for children. Let me know who you are.